Shaun Lee volunteers with Forest & Bird on the Sea Change campaign, to rebuild the health of the Hauraki Gulf. He also works for Revive our Gulf, a great initiative to restore mussel beds in the Gulf. Here Shaun explains what’s happened to the Gulf’s mussel beds, why they’re so important and how the Sea Change campaign can help restore a cleaner, healthier, more abundant Gulf. Why do want to see change in the Gulf? 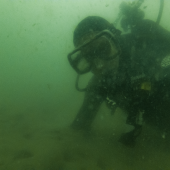 When I dive in the Hauraki Gulf I am often saddened by the state of the seafloor. The bottom is so soft in places I don’t even feel it when my hand touches the ground, it’s like soup. In the selfie here I easily plunged my arm nearly half a meter into the mud. The saddest thing here was that amongst the mud I found large dead mussel shells. The shells are huge, at least 4x bigger than anything you will find in a supermarket. 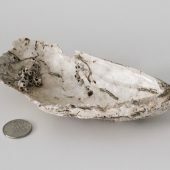 They are remnants of the great endemic mussel reefs which once carpeted the Hauraki Gulf. What happened to the mussels? Fishers started dredging them in the 1920’s and the fishery collapsed in the mid 1960’s taking with it an ecosystem that once covered more than 500sq km of seafloor. 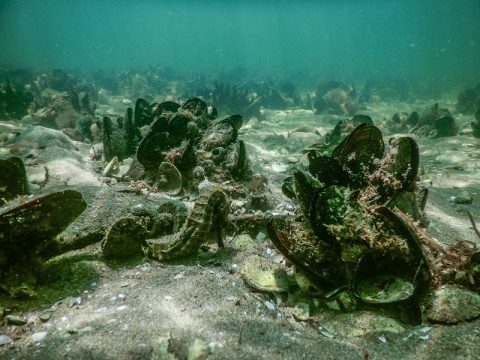 The fishers moved South to collapse other mussel reefs around New Zealand and half a century later the mussels have not come back. Today the only green-lipped mussels we find are growing on rocks, mostly in the intertidal zone. What is Revive our Gulf? I joined Revive our Gulf as soon as I heard about their plan to restore the lost mussel reefs of the Hauraki Gulf. Everyone loves the idea, a restored seafloor will support more fish and other life in the Gulf. But what got me hooked was the idea that we could clear the water. Mussels are filter feeders that strain the water for food, they eat the plankton but also remove sediment from the water. They bind the suspended sediment in mucus and deposit it on the seafloor where it can be broken down by invertebrates. Imagine if we invented machines that could do that! Green-lipped mussels even self replicate and can operate down to depths of 50M, I can’t even dive that deep! Why did I join the campaign and what is my role? Revive our Gulf have planted 130 tonnes of mussels on the seafloor which sounds like a lot but it’s really just a drop in the ocean. The Sea Change – Tai Timu Tai Pari marine spatial plan will enable more communities to restore their blue backyards and increase the mauri (life force) of the Gulf. I really want to make sure that happens. I want future generations to grow up swimming in clean, clear, healthy water. As a designer and photographer for Revive our Gulf, The Huaraki Gulf Forum and Forest and Birds Seachange campaign I hope I can help make a difference. Thanks to everyone who has signed on to Forest & Birds Seachange campaign which will help clean up the Gulf and bring back the fish.